When I was asked if I would like to review this model a week or so back I thought at first I had misheard the request and after asking the owner did he want to do a review and post it on the forum, he quite simply, in his own words, said that he enjoyed my reviews to date and was offering me the opportunity to do it. He then said that it could also have a board track test. Well, I’m still pinching myself!! This model is not one I would rush out and buy unless I was earning at least twice that which I earn now. Not because I can’t afford one, but, having grown up in the sixties, I have had to justify any expenses I made in those and consequent times. This is not a detraction from the model. Simply a statement of my financial approach to the hobby. Well, how mislead can you be!! The model in question went home with me from a Q32 meeting (along with computer and model repairs from some of the participants). The next morning I had a list of jobs I had been waiting to do on the weekend and after I had tackled a couple I then poured a good measure of Merlot into a clean glass and set about an objective review. For all models in the market place, unless you are a total slot freak, there is a modicum of requirement to know a bit of history about the model or the drivers or both! So, first to come is a bit of history. The Ferrari 250 LM appeared in late 1963 and was considered a replacement for the aging 250GTO’s and 250P’s as far as Le Mans was considered. The North American Racing team entered a car in the ’64 race with David Piper (GB) and Jochen Rindt (A) at the wheel. Possibly a good formula but unfortunately hopes were dashed very early on when a ruptured oil pipe took them out of the race after two hours of going no where!! 1965 was to be a different story with the NART coming home victors. Admittedly, these were the (long nosed) 275 variants but the business end was very much the same. The Swiss racing team Scuderia Fillipinetti managed a sixth with their car. ’66 was the year of attrition with only fifteen cars finishing, It was Fords turn for a 1, 2, 3 too and all 250’s entered managed NOT to finish! (It is interesting to note that there were no less than thirteen ford GT 40’s at the start and another thirteen entered but didn’t take part!!! By ’67 the 330 had donned the vest of successor to the 250 GTO’s and the 250 LM was to have a very minor roll in things to come. 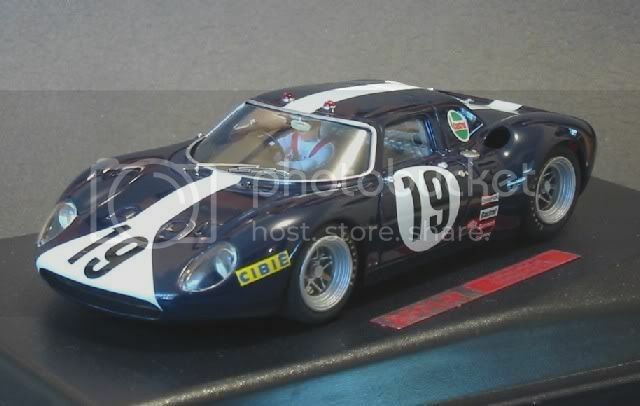 ’68 was to be the swansong for the model as Ford and Porsche hacked mercilessly into Ferrari’s reputation and 69 saw the last entrant of a 250 LM entered by NART take eighth place before the aging 250 LM bowed out of Le Mans. They continued in motorsport for some time and during the years from’64 to ’67 they competed in a variety of international motor sport events including the Paris 1000 km, Rhiems 12 hour, The Angola GP??! 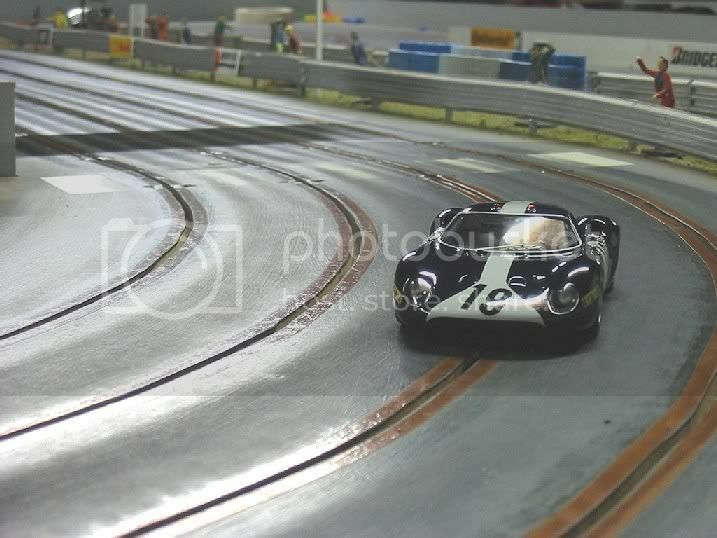 !, Spa 500k (winner) Kylami Rand 9 hr and locally the ’66 and ‘67 Surfers Paradise 12 Hour (winner). The car was caught on the cusp of events. ’64 was a measurable point when GT and endurance motor sport turned another corner. The 250 LM was last of the old generation and first of the new and with Porsche and Ford dictating terms it was destined to a short career. 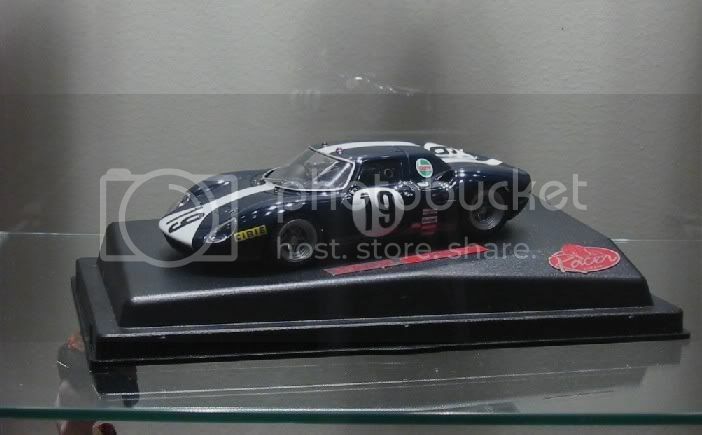 The model depicted by Racer is a replica of the Paul Vesty entered 250 LM which raced in Le Mans in 1968. Buy now it was four years old and the 3286cc V12 was showing signs of age and reliability was not going to be on its side with the car being placed 37th. Retiring after eleven hours, on lap 99, the gearbox proved not to be up to the event. No Matter. One of the last Le Mans appearances of a stunning car. No one must be able to deny the shear lines of this model. All the external fixtures had style and panache. Non of the angular utilitarianism of cars past and to follow. It was designed to cut through the atmosphere with the minimum of effort and in so doing, present, as a picture to the world, a styling only recently equalled!! Well, what has Mr Racer done to ensure this beautiful model pleases from every angle much like the real thing? Well, quite a lot actually! This is the first Racer model I have had the opportunity to review and before I donned my white sterile gloves and face mask I took the opportunity to stare at it for an extended period of time! 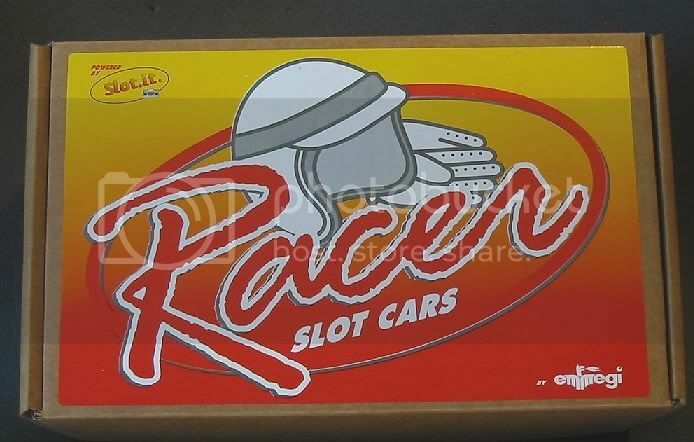 Before you even see the model, Mr Racer has made sure you get the message with a cardboard delivery carton emblazoned with their logo shouting ‘Come on!! Open me! So open it we inevitably must! Inside is a good sized clear display case with the model sitting on its plinth. I now know what it must have felt like when Howard Carter broke through into Tutankhamen’s tomb all those years ago! Lifting the case out I was in sheer awe of the finish. 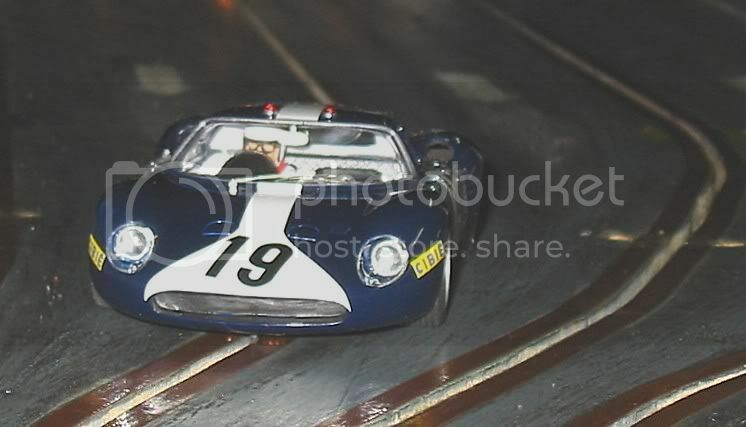 Most slotcars don’t have that sheen!! Nay, gloss that they should have. Cars don’t come matt, semi-gloss or satin as some would have us believe. They shine, really, they do!! When they are rolled out of the transporters they positively gleam! It’s later on, after a bit of hard track use that the shine goes off! This model positively gleams too. I’ll give Mr Racer 9.875 out of ten for that! Why so low? 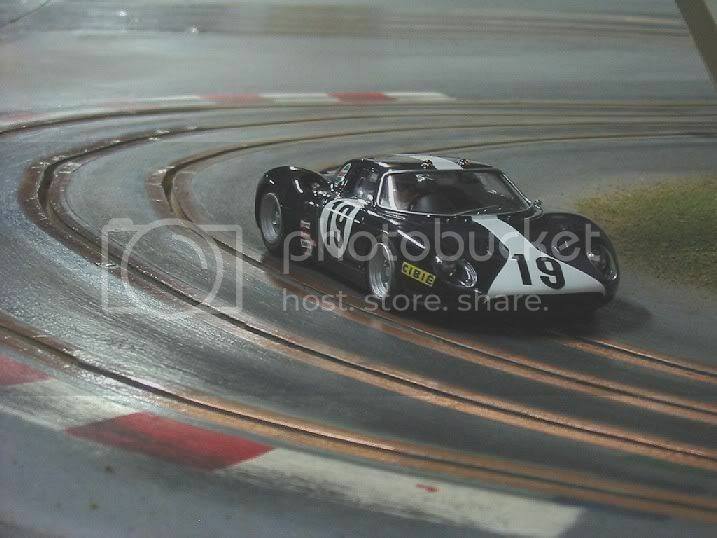 Well, I’m going to be a bit of a Philistine because, had this been in the Scalextric, SCX or Fly price bracket then I would have shut one eye and not worn the gloves! But this isn’t and if you know what these retail for, then you too would get your microscope out! The external body detail is great. Being the early days of sponsorship, there isn’t too much by way of decals. A few down the front wings/fenders/guards and that’s it. So the paint job becomes the focal point and whereas 98.75% of the model’s surface is impeccable, there are a couple of flaws. One being a dust spec in the clear coat and the other being again a flaw in the clear coat, but this time a tiny but noticeable pinhole sometimes caused by another liquid present in the wet stage. Nitpicking, probably, but there nonetheless. All else with the body is rated A1 at Lloyd’s. The light units are the traditional round lights much the same as Fly use in their models and the light covers are well made clear injection mouldings. A good fit too. The rear lights look to be injection moulded and are simple and effective and there are a couple of tiny lamps on the roof which look as if they may have been glued on. The fuel filler caps and wiper are the only other ‘add-ons’ to the body. All other features look to be part of the casting as there are no parts protruding into the interior. An especially nice touch are the rear grilles and the grille over what would be the intakes. These are of a very fine photo etched material. Detail a lot finer than is seen on mass produced models and as such could well be vulnerable in a mishap. 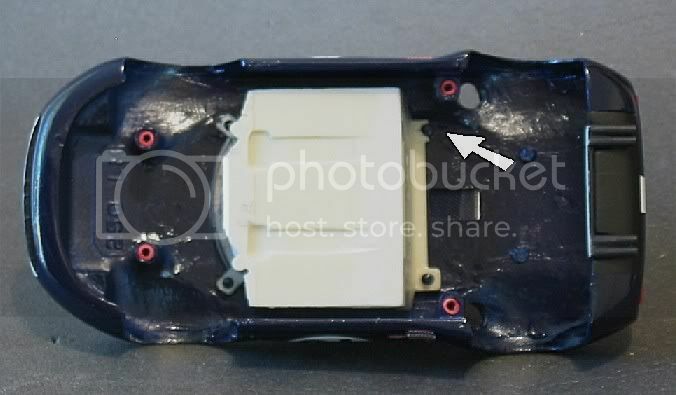 The underside of the body is plain and simple and has four cast-in body mounting posts that have plastic inserts for the fixing screws. The clear screen material looks very much to be a vacuum formed piece and its flexibility is apparent. It is mostly a very good fit but does display a bit of an air gap at the bottom of the side windows. There is also a thin metal rear view mirror fixed inside the roof too. Lastly, the driver’s tray is a chunky casting which is well appointed. A mass of dials and gauges in ‘Technicolor’ adding a nice touch. Quilted panels adorn the inside of the tray and there is a driver intent on winning. The driver could have possibly had a little more of its moulding flash along the arms and helmet removed before painting but I suppose he will be hardly visible in situ. Even the gear shift has its gate truly modelled on the cockpit floor. I can only assume that the driver’s tray is supposed to be fixed to the underside of the body? On this model, the driver’s tray was actually loose and there was at least one locating lug partly missing. Nothing in the box and nothing in the model leads me to suspect it has been assembled like this! An observation I have made whilst looking round the body is that the resin moulding is quite thick. Indeed, a body weight of 50 grams including the driver’s tray is quite high. Thirty would have been a more ideal maximum but I can see why. In this model and others like Ocar and A2M (forbid I mention them in the same article!) the modeller has attempted (and quite successfully too) to model the door and panel gaps of the real thing. In order to do this, the model has to be scored deeply in these places. How it is done varies but a depth of 0.2 or 0.3 mm hardly seems deep enough and a coat of paint would soon eradicate part or most of them. A gap of 0.5 seems to be more reasonable, agree? Well, due to the nature of resin casting, the body will need to be at least 1.0 mm thick to allow for the weakness created by a 0.5 mm door gap! Anything less could see a side impact physically open a door!! As it is, most resin body makers aim at a 1.5 to 2.0 mm thick body although they do tend to thicken them up at the front and rear for obvious reasons which then accounts for a heavy body. The glorious glitzy side of this model covers a very serious ‘business’ end. This being the chassis and all its attendant parts. The chassis is designed to do the business too. Made by its fellow countryman ‘Slot.it’, it is pure business. This is a full on “Slot.it’ chassis with a sidewinder pod configuration. The motor is an orange double ended type rated at 21,500 rpm. 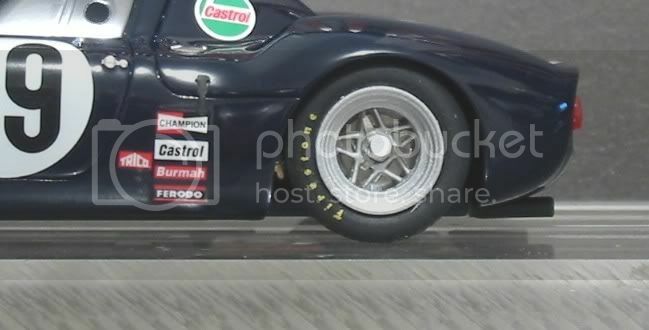 On this particular model both output shafts touch the tyres and are causing drag. What to do? Not sure yet. I will decide when it comes to a bit of track time. I didn’t want to make any permanent alterations to a model which wasn’t mine!! 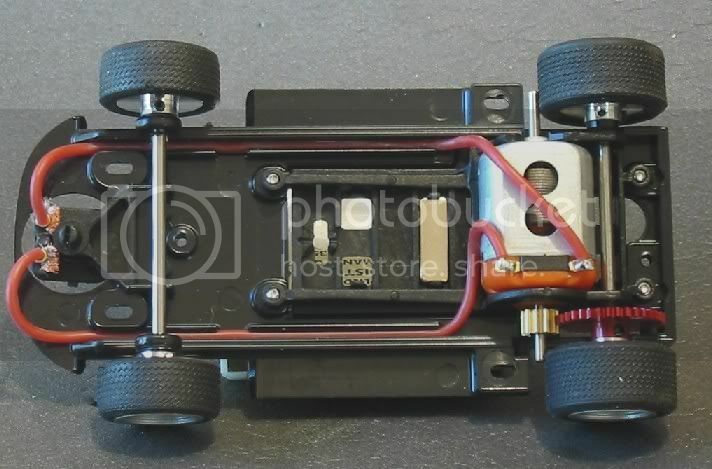 As with other Slot.it chassis, this has a pod which can be adjusted in the main chassis by four 2 gauge screws. Slackening them will give the model a little more body roll separate from the drive train which is conducive when cornering hard on uneven surfaces like plastic track. I note too that the front axle is fixed in the chassis. No ‘clonker’ axle here! Neither is it a mil off the ground. On my acrylic set up board the front wheels revolve as the model is pushed along. These are making contact and as such will act as outrigger type stabilisers especially when raced on non magnet track. This flies in the face of those exponents of the tripod chassis. I defy any of them to tell me (and a pantheon of Slot.it owners) this chassis is flawed by having all four on the floor!! For the uninformed, Slot.it axles don’t run in the traditional brass or nylon bushes. As Slot.it wheels are alloys fixed with grub screws, the axles pass through enlarged parts of the chassis moulding giving a firm mounting with minimal slop and as the wheels are attached with grub screws, the axle side play can be set to an infinitesimal minimum! This particular model has NO sideplay and I expect it is contributing to the stiffness in the rear end. It strikes me that before any of these models are run it would be wise to go round the model and check the operating clearances. The final drive is via an eleven tooth brass pinion and a thirty six tooth alloy spur gear, These are totally dry on assembly and I can not stress more, the importance of lubricating these before you run them. Irreparable damage can be done to the alloy spur buy prolonged running dry! Even truing tyres (which is not necessary on this model), will cause harm to the gears. The motor is the only ‘clip in’ part and closer inspection shows that it is in fact a little loose. On a board track it may well generate a bit of judder on quick uptake and with the close fit of the interior and body parts, I can’t see hot glue being a remedy if it does. The guide is a brilliant fit. So rare these days. No front / back slop and no side to side play either In fact, it could do with being a little looser as it is causing the guide pin to pinch in a very well reinforced guide hole. This may well prove to be a marshalls nightmare but in reality, I don’t think this model is ever going to be marshalled!! 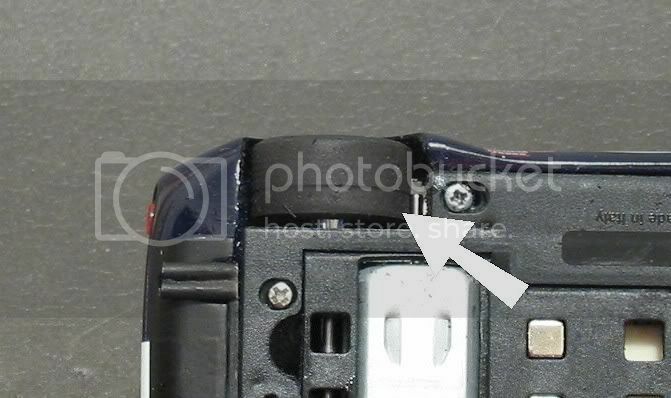 The familiar Slot.it silicon lead wires are held well in their chassis recess’. Lastly for the chassis, the wheels are machined aluminium and needless to say, are true. The tyres are well modelled depicting what can only be described as intermediates, although I don’t think this expression was current in the sixties. They are concentric and feel to be of a good compound being slightly tacky to the touch. Racer has opted for wheel insert in closed hubs. 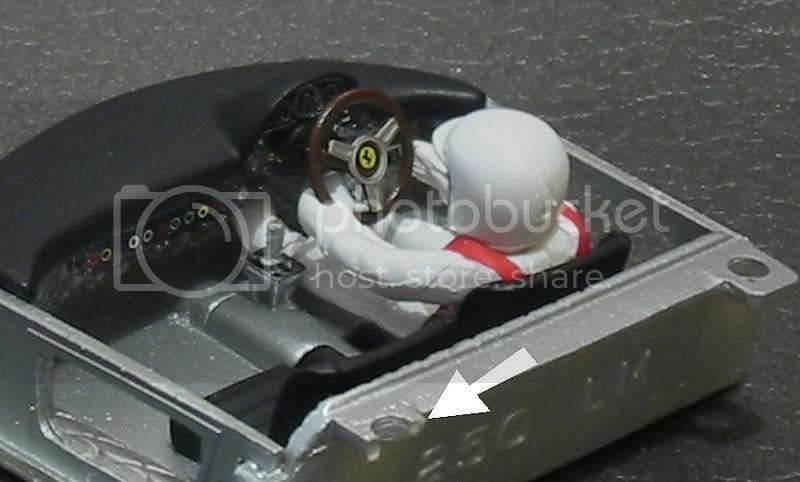 That is, they have modelled the five spoked Ferrari wheel and outer rim detail as a moulding and have inserted them into a blind wheel. By this I mean that although there is a five spoked wheel and a disc, you can’t see through the wheel as the back is solid. Also, one front and one rear insert is crooked in the wheel and both spinners on the rear are quite a bit off centre. Not to worry, I am just a little concerned that these items are the sort of things that don’t ‘come home’ after a hard day at the track! The drive train ‘pod’ in the chassis carries the traction magnet too. There are two extra magnet slots. One is directly under the rear axle and there is also a spare position a little further to the front for the adventurous! 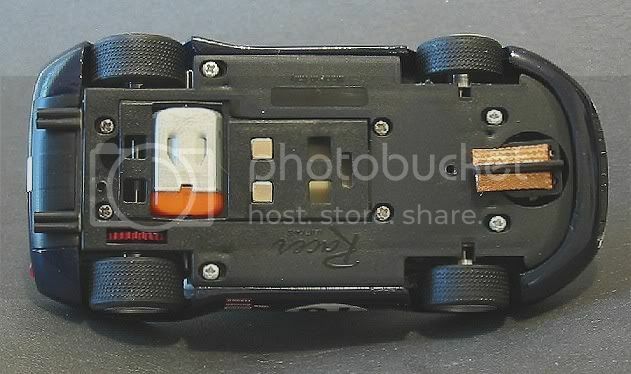 On this model the magnet is a little lop sided and if the model were to be raced it might be necessary to file the magnet location to even up the magnet aspect. Whilst on the topic of the magnet, it can be noted that the chassis has about 2.5 mm ground clearance. 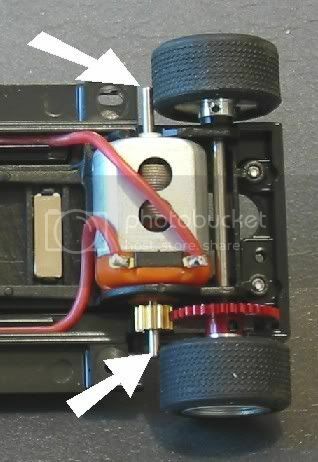 When the chassis is placed on a piece of Carrera track (stainless) with the current magnet, there isn’t enough flux to hold the chassis to the inverted track piece which to me would indicate that if this model were to be run on plastic track, a degree of self restraint would be necessary to keep the model on course. Once again, not a criticism but an observation. I, of all slot racers, would be the last to condone ‘stuck–down’ racing. But I do feel that half a magnet is more dangerous than none! Especially with a model that weighs in at 110 grams. A last observation would be that, when the model was removed from the display case, it was fixed rather unceremoniously by a couple of bronze coloured countersunk, self tapping screws! Considering the chassis has the original ‘Slot.it’ bayonet fixing point in the pod, I can’t see why they haven’t devised a clip to use this facility.? Well here we are! It’s come to this, I only hope that nothing goes wrong or I could quite quickly be the owner of a truly superb but rather second hand Ferrari 250 LM!! This model has had an armed guard since it left my house for the test track, between times it had to go to work with me and rest securely locked in a filing cabinet whilst the rest of my slot racing paraphernalia slummed it in the boot of my car in the works car park. Once at the track, which is a very technical four lane board track (see Wooloowin Raceway, this forum) we had to sponge down the surface and then run cars on the lanes ‘til they were gripping well, firstly with some soft tyres as they seem to do the business more quickly than with the faster cars. All the time I was sure I could hear the model knocking on the inside of its box on the bench, giving little revs to get my attention. Surely not? Settle down Phil, you’re spooking yourself. Get a grip man! Pizzas arrived and the small group gathered settled into more immediate things like food and drink. As the boxes started to empty of Australotalian quisine there was talk of getting back on the track!! No, No, wait a bit, there’s just one thing to do! Inevitably I walked apprehensively to the bench, staring at the large red crash helmeted box, did it move?? Nohohohohh. Leaning over, it felt like an age before I reached forward and gripped it. Pulling the flap open I lifted out the display case and its treasure and once again I felt like Howard Carter must have felt when he poked that first hole through into the burial chamber. Placing the display case down I removed the lid and undid the two self tappers (I still can’t believe that!) and with both hands a tremble, lifted the model, almost as a votive offering, on high, making my way to the track where a small group had gathered to witness the unthinkable. I had made a couple of adjustments to the model, well not exactly adjustment, more tuning and longevity aids. Firstly, with the dragging rear axle still apparent, I loosened the right hand rear wheel with a Slot.it allen key and moved the wheel out ‘til there was a minimum of end float in the axle. This alleviated the stiffness a little and the remainder was definitely attributable to the motor shaft lightly touching both rear tyres. Another adjustment made was to loosen all the pod screws half a turn. This was to allow the particularly heavy body a degree of detachment and thereby hopefully encourage the model to sit more firmly in the bends, not that it was going to get pushed that hard! Lastly, the gears were lubed with a moderate application of Vaseline (petroleum jelly) if only to preserve the alloy gears integrity. The axle bearings, too, has a small squirt to set them on their way. Placing the model on green lane and not fully knowing what to expect, I pushed of at one third throttle, one half throttle? Three quarters throttle!! The model pulled away rather jerkily and after some hard throttle openings the model made it to the pit lane exit where it stopped!!??. Closer inspection revealed the motor shaft was more than brushing the right hand rear tyre. I gathered up some sand paper and with the throttle set at half speed I lightly sanded the rear tyres. It was obvious that the right rear tyre had been fouling the tyre more than expected. The sanding eased the problem and mindful of engine temperature, I sanded a little more ‘til the motor was revving quite freely. This saw all but a vestige of tread removed from both tyres, but the model was going no were as it was originally. Placing the model back on green lane saw the model move off healthily this time, feeling less nervous and a little more confident I took the first three or four laps at a fast cruise rather than a racing speed. The model seemed to gain momentum with each lap and with a short stop to splay the braids a little more I then set about a fast but steady run. Running at 13.8v and two amps supply through a Parma 45 ohm controller the model was very responsive. Tyre grip was exceptional on the rubbered painted surface and corner grip was in the ‘very good’ category! I was lapping in the low twelves and the model was getting quicker and quicker. An annoying rattle was developing and when it turned into an intermittent squeak I stopped the model and checked it briefly. The noises were coming from the front axle. As mentioned before, the axles run in holes in the chassis proper and a couple of drops of oil on the axle ends saw the noises subside considerably. The squeak disappeared and the rattle was reduced to a minimum. Replacing the model on the track, I pushed off once again. This time it felt and sounded altogether better and all the time it was getting faster and faster. The times tumbled to 11.3 seconds. Bear in mind this is not my car and all the time in the back of my mind I am conscious of its value and superb detail!! Best time for me was an 11.3 and pulling up I gave the model a quick once over. It was immediately apparent that the motor shaft had been wearing quite appreciably on one side of the model. The tyre on that side had lost rubber and a flat had been worn in the tread area. Turning the axle by hand showed that the bedding in was complete and there was almost no drag to the rear axle. The model was replaced to the track and the drive was given over to good friend and top racer Lindsay. With instructions not to crash it, he set off and after some settling in laps he achieved a best lap of 11.265! So how was it. Once over the teething problems the model soon demonstrated that at 110 grams it wasn’t about to do anything silly or unpredictable. Acceleration was smooth and predictable and corner entry speeds were high with no sudden jerkiness or wheel lifting. Powering on once in the corners was also a treat. Again, nothing sudden or unexpected and no chattering or juddering from the rear end (although the front axle was still chattering away in the background). The tyre compound is very soft, softer even than Slot.it P3’s and the model took immediately to the painted track. Minimal ‘tail out’ through the sweepers saw a smart exit and a quiet but fast acceleration. The model was really one of the better 'out of the box’ models I have driven. So much so that whilst doing the test laps, I was regularly and almost monotonously doing 11.5’s lap after lap with minimal variance. Had the model been mine I would say that it could have been pushed to an eleven dead as it felt that steady. 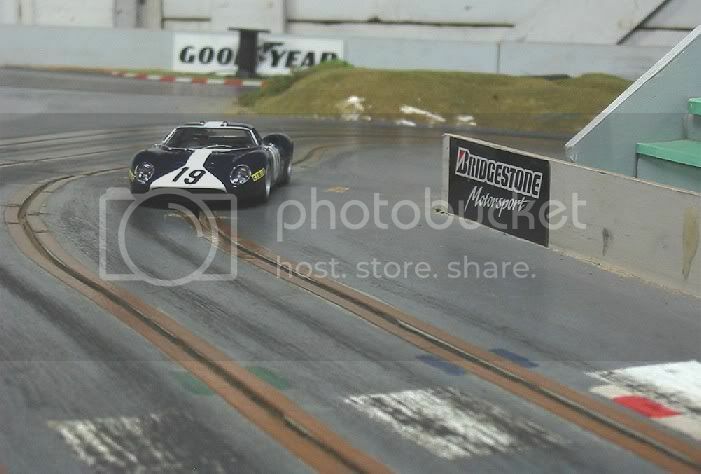 It was all over, and I would have to conclude that as a great model it was a good slot car. The problems experienced with some body detail and especially the rear axle set up shouldn’t have been there! It had faults that a lot more affordable models don’t have but after driving it I would say that although it isn’t in the same class as full Slot.it models as far as performance goes, it is still a pleasurable model to drive and handles as good as any model of its type which might have been set up and ballasted to race. I was pleased to have tested it and glad that it showed some qualifying features rather than being just a show pony. Finally, I could not help but compare it with 250LM’s of days gone by. 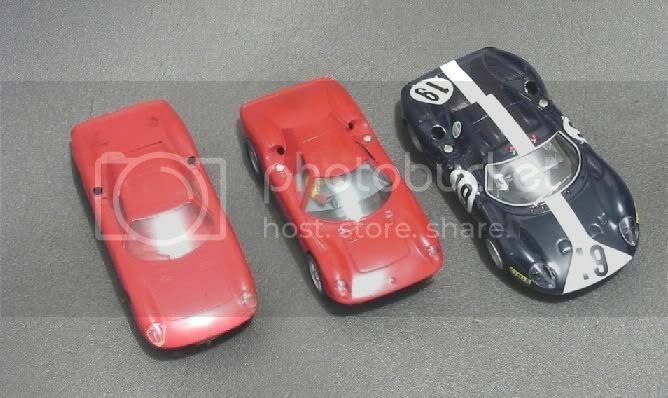 I have the Monogram and the Airfix versions, both faithfully reproduced for their time and in true 1/32 scale? The Racer is considerably wider and marginally longer. 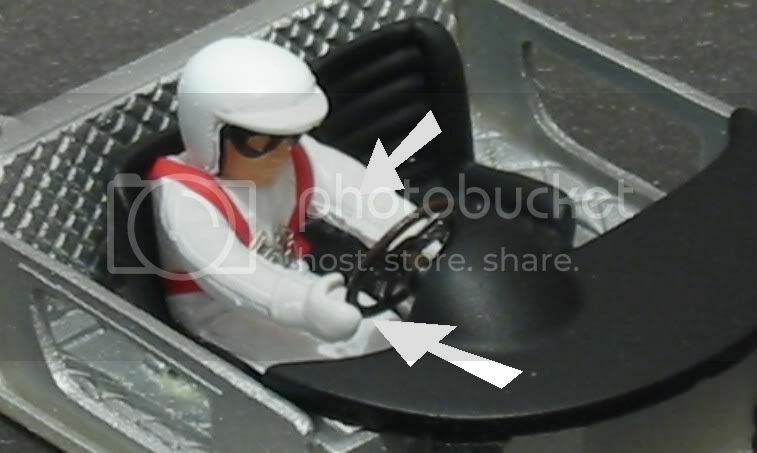 From pictures of the real thing I would say that Racer have their proportions about right but, as they don’t seem to advertise anywhere that this is 1/32 then we have to assume firstly, that it’s not, and secondly, that it’s not important if it is or not. I suspect that Racer are a bit tongue in cheek about calling this a racer, and beautiful as it is, to me it is still as sacred as a real Ferrari or Porsche or Maserati etc. might be! It may well do two hundred miles an hour but it’s never going there in anger! It is hard to believe when driving it that it has a 21,500rpm motor. The short armature has speed but is lacking in that little extra torque required to haul. I would say that an NC5 or a Cartrix TX5 would be more lively. 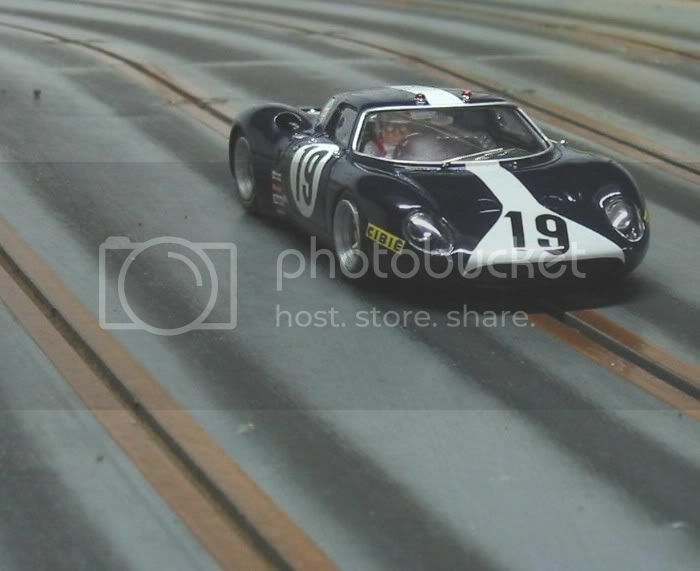 So, to me this is a glorious slotcar, a splendid slotcar, a beautiful slotcar, but that’s where it starts and finishes. Would I buy one! Most certainly, and it would get an outing regularly. Probably a few cushions in the corners and foam on the track everywhere, but I would drive it. But until I can justify that expense I will have to admire it from afar. Except on this occasion where a benevolent fellow slot racer has trusted me with this work of art! So, if you have the mazoola, and you like the looks of it, go and buy one, you won’t be disappointed and hopefully it won’t have the same faults. And when you aren’t racing it, put it in a glass cabinet with down lights and you will smile inwardly every time you pass it by. 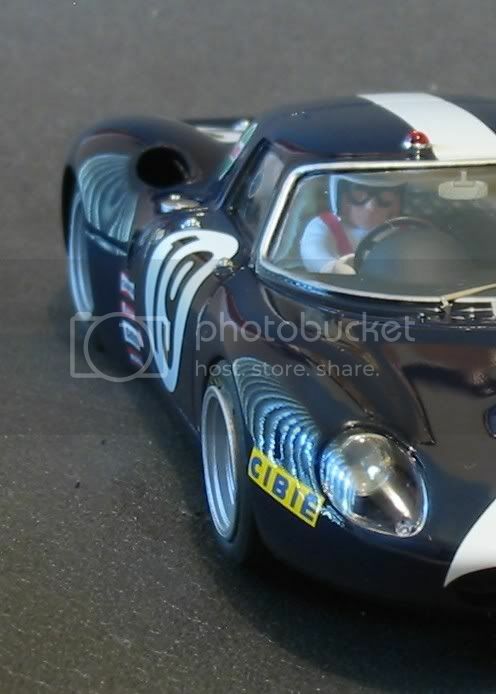 The model was very kindly loaned to me by fellow Q32 and Slotcar Legends racer Glen Perrin for which I thank him profusely for giving me the opportunity to test first hand one of slotcars sacred marques.